On 21 November 2013 various non-governmental organizations walked out of the Warsaw climate talks. I am glad I have not attended for the last two years as I feel corporate interests have taken over the UN Climate Conference. The exhibit included thirty photographs documenting Indigenous Peoples, organizations and social movements working for climate justice. The photographs were taken at events on six continents–from Bali, Indonesia to Espirito Santo, Brazil – Durban, South Africa and Chiapas, Mexico, to name a few. 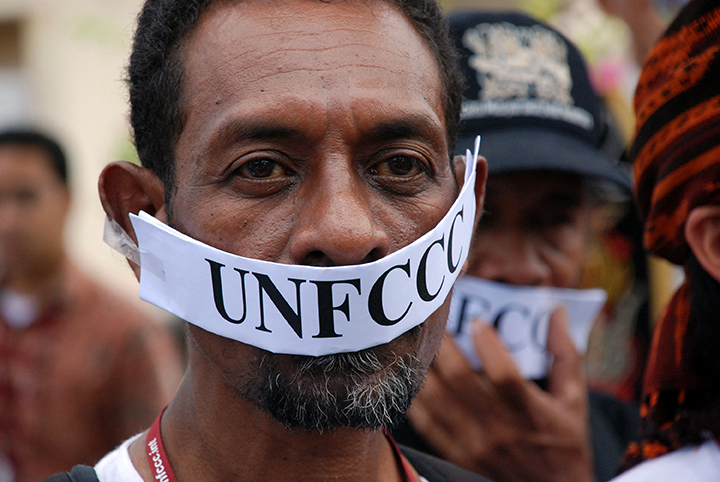 Above: An Indigenous man with his mouth covered by a UNFCCC (United Nations Framework Convention on Climate Change) gag during a protest at the UN climate talks in Bali, Indonesia. The gag symbolized their systematic and forceful exclusion from a UN meeting with the UNFCCC Executive Secretary they were invited to the day before. It also symbolized and their exclusion from the official negotiations even though it is their lands that were being targeted for climate mitigation schemes. On May second, scientists published a new study confirming that the biggest, oldest trees in the forest are crucial for mitigating climate change. The study took place in Yosemite National Park where researchers found that while trees larger than 3-feet in diameter made up only 1% of the trees in the forest, they stored nearly half of the forest’s carbon. This has significant implications for efforts to curb deforestation-related carbon emissions. Industry would like us to believe that where climate change is concerned, a tree is a tree is a tree, and there is no difference between an industrial tree plantation and a native forest. We can cut the forests, they argue, as long as we replant. But as this study points out, you cannot merely “replace” trees that have 200 or more years of carbon stored in them. You have to stop cutting them down. The world’s remaining native forests need to be taken out of the hands of corporations and returned to the communities that depend on them–for this is one of the best ways to protect them.